As the crisis in Ukraine deepens, the question often asked is, “where will Russia strike next?” Nowhere, hopefully, but Moldova looks vulnerable. Like Estonia, Kazakhstan, and Latvia, the small Eastern European nation has a significant Russian-speaking population. Like Ukraine, it has tried to move closer to the West. And like Georgia, it contains a break-away region—Transdniestria–controlled by Russian proxies. What are the prospects for Moldova’s future? The current Moldovan government has made closer European integration a priority. Indeed, the ruling coalition of three liberal democratic partners formed an Alliance of European Integration during the parliamentary elections of 2010 to keep the Communists out of power, despite the latter winning the largest share of the vote (39 percent). Major steps towards European integration have been taken in the past few years, as signified by the initialing of the Association Agreement between Moldova and the European Union (EU), including the Deep and Comprehensive Free Trade Area (DCFTA), at the European Summit in Vilnius, Lithuania on November 29, 2013. At the same time, the government has been careful to maintain good relations with Moscow, and to intensify dialogue with the break-away region of Transdniestria. But with elections pending, and growing instability in its neighborhood, will Moldova be able to continue the process of European integration? And will it be able to “reintegrate” Transdniestria, or will internal and external forces break it apart? Five scenarios are worth considering. If “reintegration” is a non-starter, why not try to hammer out a new deal to define and normalize the relationship between the parties in a mutually beneficial way? This is the approach taken by the so-called “5+2” process involving Moldova, Transdniestria, the Organization for Security and Cooperation in Europe (OSCE), the Russian Federation, Ukraine, plus the United States and the EU. But while some progress has been made on confidence-building measures, there has been no serious attempt in the last ten years to address the overall political settlement of the conflict that broke out more than twenty years ago. A new proposal is not likely in the pre-election period: Moldovans (for whom the word “federalism” is almost taboo) are more interested in the economy than the status of Transdniestria. Furthermore, for Chisinau, any deal would have to be EU compatible and viable, whereas for Tiraspol a deal would have to protect its interests. On paper, this is possible (and worth pursuing). But the precedent of Crimea has whet the appetite of key players in Moscow and Tiraspol to have Transdniestria completely break away from Moldova. Furthermore, at this stage, the Moldovan government has few sticks or carrots to change the opinion of power brokers in Transdniestria. Since “reintegration” is interpreted by the Transdniestrians as assimilation, and conditions are not ripe for a new deal, the default position is the status quo. But this is hurting both sides. Moldova is the poorest country in Europe. It is estimated that one third of its GDP is based on remittances–one of the highest percentages in the world. Transdniestria is no better off. It is heavily dependent on subsidies from Russia, and its population (estimated at around half a million) is dwindling as young people (as in the rest of Moldova) seek opportunities abroad. North-South and East-West trade routes, which should transit Moldova, make a detour around it, effectively cutting the country off from the benefits of increased European and global integration. While there is a high degree of inter-ethnic tolerance in Moldova, over the past twenty years, communities on either side of the Dniestr have grown apart. They live in two worlds: Moldovans (even though most understand Russian) generally look to the West, to Romania and the European Union, while most Transdniestrians are influenced by news and culture from Russia. So why is there no hurting stalemate? Moldovans continue to find jobs abroad, and make enough to scrape by, while Transdniestrians are on a life-support system from Russia. Furthermore, there are influential actors on both sides of the river who are profiting from the status quo, both politically and financially. What if the government changes in Chisinau, and is less European in its orientation? In return for taking a less pro-European approach, a new (i.e., Communist) government could agree to a new deal that keeps Transdniestria within a united Moldova, but moves Moldova as a whole closer to the Russian orbit, for example, as a member of the Customs Union. This has been described as the “Trandniestrianization” of Moldova. But, as in 2003, such a deal would be strongly resisted by a significant proportion of the population for being not viable and not in line with EU integration. If the status quo is a lose-lose situation, and a new deal is not likely, then what about a divorce? Transdniestria would finally achieve its dream of secession, and Moldova would be rid of an albatross around its neck that is slowing down its integration into the EU. But partition would not be so easy. First, communities on both sides of the Dniestr are multi-ethnic. 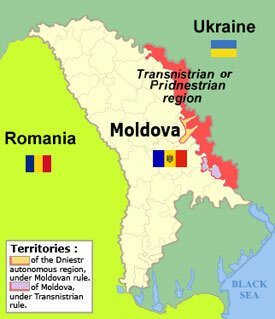 For example, at least a third of the population of Transdniestria considers itself Moldovan (or Romanian). Would they leave? Second, some territory controlled by the Transdniestrians (such as the city of Bendery) is on the western bank of the river, while some Moldovan settlements are on the eastern bank. Therefore, it would be hard to make a clean break along the banks of the river. Third, what would happen to Gagauzia, the Turkic region of Moldova which was granted considerable autonomy in 1994? Would it also push for independence? Fourth, what status would Transdniestria have? It could hardly survive as an independent state, so would probably join the Russian Federation. But, like Kaliningrad, it would be separated by hundreds of kilometres from “the Motherland”? Fifth, would Moldova minus Transdniestria remain a neutral state, or would it join NATO? Indeed, would it remain a state at all, or would it join Romania? In short, Moldova faces existential questions about its future. On the one hand, a new deal seems like the most advantageous scenario. However, with elections on the horizon and a worsening situation in Ukraine, conditions are not ripe. Furthermore, efforts to integrate with Europe could lead some in Chisinau to conclude that they are better off without Transdniestria. Whatever the motivations and actions of the parties within Moldova, the country’s fate will be heavily determined by external factors. Since Moldova sits on the fault line between Eastern and Western Europe, its destiny is closely linked to the future of the European security space. Moldova could either be a bridge between the Euro-Atlantic and Eurasian halves of the continent, or the Dniestr river could be a new dividing line. It is not too early to learn lessons from the crisis in Ukraine in order to prevent greater instability in Moldova. Walter Kemp is Senior Director for Europe and Central Asia at the International Peace Institute.